Are You Wasting Your 404 Page? 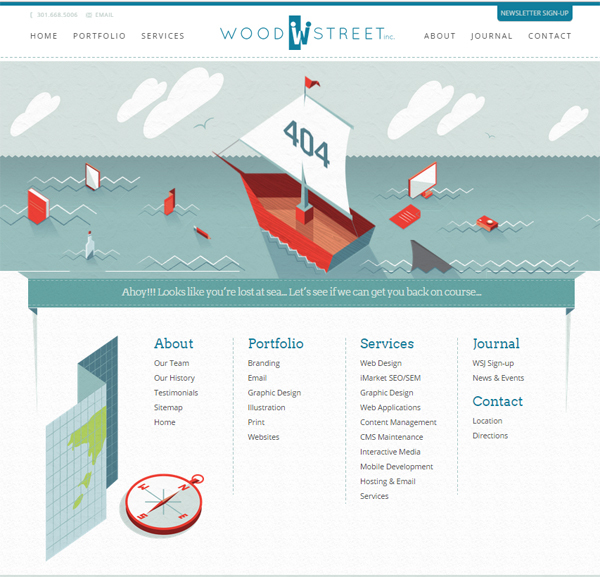 - Wood Street, Inc.
What is a 404 Page? You’ve seen them plenty of times. They’re the pages you land on when you’ve entered a web address incorrectly or gone to a page that has been removed. Quite frustrating really. You’re hoping to get some information you need and you end up there. This is not only frustrating for you but also a wasted opportunity for the owner of the website. Every page on your website should serve a purpose to the user. We’ve spoken about it before in this post on usability and this post on utility content. But, with a 404 page it’s hard to know the user’s intent when they get there. They could be looking for anything. So, how do you use a 404 page to solve this problem? As you can see, we’ve had a little fun with the “Lost at Sea” animation. But, more importantly, we haven’t taken the fun too far. This page does exactly what we need it to: send someone who is lost in the right direction. So, what happens on your website when someone gets lost? Are you wasting this opportunity to engage with a potential customer? These are simple to set up. At a minimum, contact your website developer and ask them to help. But, I challenge you to go a step further. If your company has a sense of humor, use that. If your company is known for solving problems, here’s another chance to help. Your 404 Page is no different. Now, go make sure it’s the best 404 page it can be! Need help? We’re here for you!